Here in Germany summer is a long time coming. It’s about 40° Fahrenheit, it keeps raining and the sun is a very rare visitor. One might wonder if people just ate stew and other wintery things all year long. But I thought to myself, why wait for the summer if I can just bring it into my kitchen (and on your my, of course). 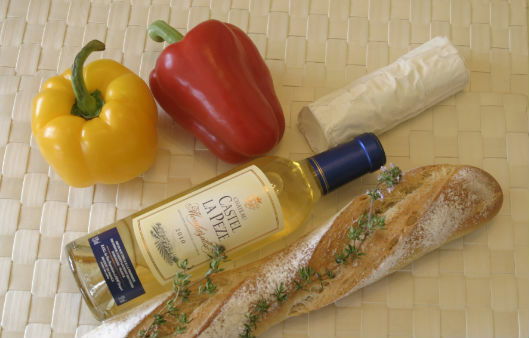 So here are my ingredients for a delightful summer evening – all you need is some goat cheese, some peppers and a nice Sauternes. Cut the peppers into thick slices. Heat the oil in a frying pan and steam the peppers. Deglaze with some balsamic vinegar, salt and pepper to taste. Let the pepper salad cool down a little bit. Cut the goat cheese into two slices if necessary and put them into a small ovenproof dish. Mix the thyme with the wine, pour this over the cheese and put it into the oven. Broil this for about five minutes until the cheese has a nice golden-brown colour. Sprinkle some more thyme over it. 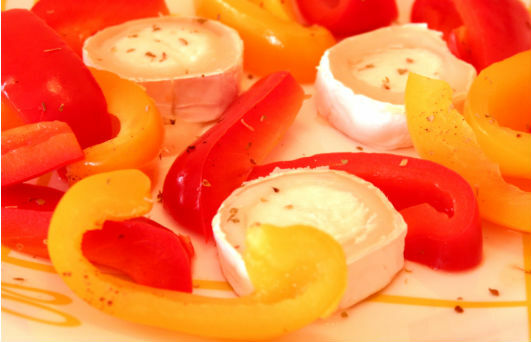 Serve the cheese with the lukewarm pepper salad and some slices of baguette. Now enjoy your delightful meal and the remaining Sauternes on your terrace or balcony.